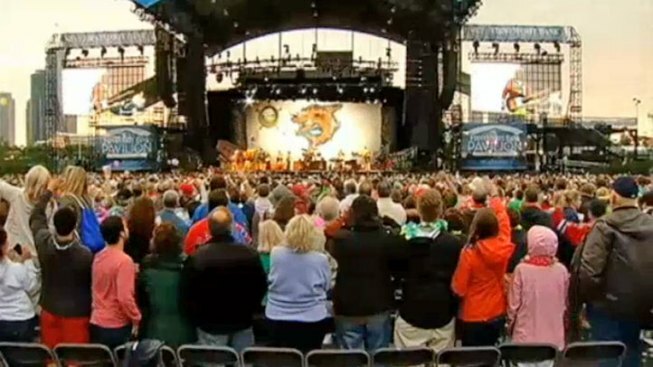 Jimmy Buffett performs at the newly-renovated and renamed First Merit Bank Pavilion on Northerly Island on Saturday, June 29, 2013. 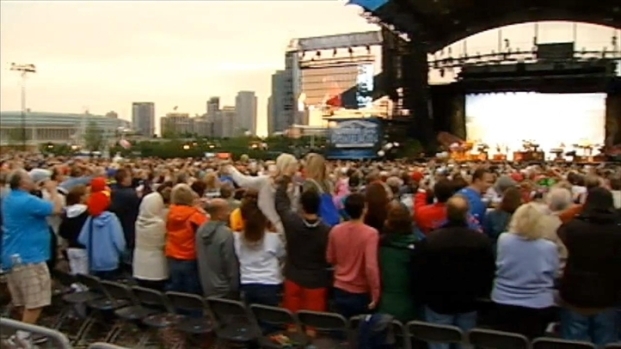 Entertainment company Live Nation this week offered complimentary tickets to a future summer concert to those who held lawn seat tickets to last weekend's Jimmy Buffett concert at Northerly Island. "We apologize for the wet ground experienced by lawn patrons on Saturday, June 29 and so we are inviting those people to be our guests at another Live Nation outdoor show this summer," Mark Campana, the company's Co-President of North American Concerts, said in a written statement. Online review site Yelp.com was full of one-star reviews by unhappy Parrotheads complaining about the muddy, rain-soaked ground. Other concert fans complained about poor sound, the quality of the beer and drinks and a lack of amenities to handle the crowd. But it was the mud that seemed to really sour the experience. "I came to a point where I no longer even cared to stay at the concert and began walking out and literally lost my shoe in the mud," reviewer Kelly N., of Chicago, said of the first event held at First Merit Bank Pavilion. "I could give negative stars, because in my opinion, the experience at the newly renovated Northerly Island was atrocious." The company blamed the muddy conditions on "record-breaking rains" in the days leading up to the show. "As a result of these conditions, the lawn retained a significant amount of water and some lawn seating patrons encountered mud or were subjected to compromised sight lines as other patrons moved away from muddy areas," the statement read. Live Nation's officials said ticket-holders would receive an email about how to get a complimentary ticket to an upcoming show at FirstMerit Bank Pavilion, First Midwest Bank Amphitheatre or Alpine Valley, based on availability.